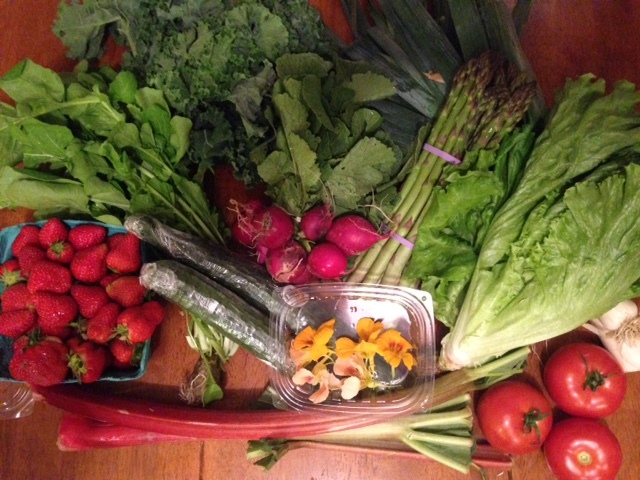 It was another exciting week for the Fifer’s Orchard CSA Delmarva Box! Once I got the preview email last week I knew I would have to get creative because I had no clue what to do with the leeks and I did not even know what rhubarb looks like! Thank goodness for the Internet because I was able to find two great recipes! 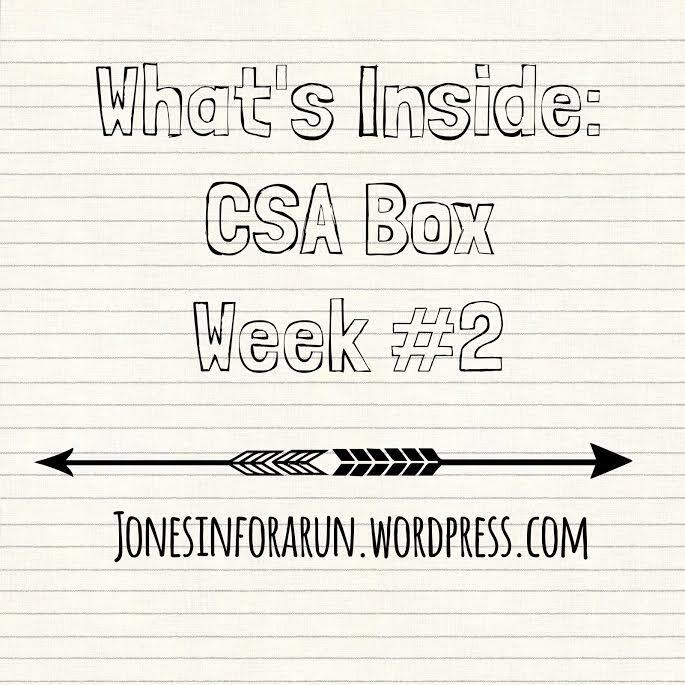 Courtney also has shared some things she made this week as well! Double the Fun for week 2! The lettuce (minus the kale) I put to use in my salad for dinner last week and part in lunches for this week. I love the Tropicana lettuce and we even used some for a burger topping for our family BBQ we had over the weekend. I think next year I will try and plant lettuce- We seem just go through so much of it – why not? We also used the juicy and oh-so- ripe tomato for the burgers and again some in my lunch salads. I love a good red and juicy tomato and boy these fit the bill this week! I used the cucumbers the same way as last week- good old cucumbers in vinegar. 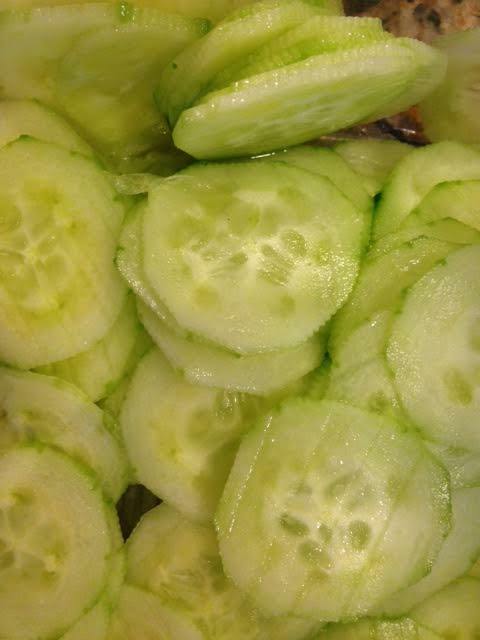 As I just mentioned we had a family BBQ so cucumbers always is a good and easy side item. I must say each time I make them they do taste a little and little more like my moms! 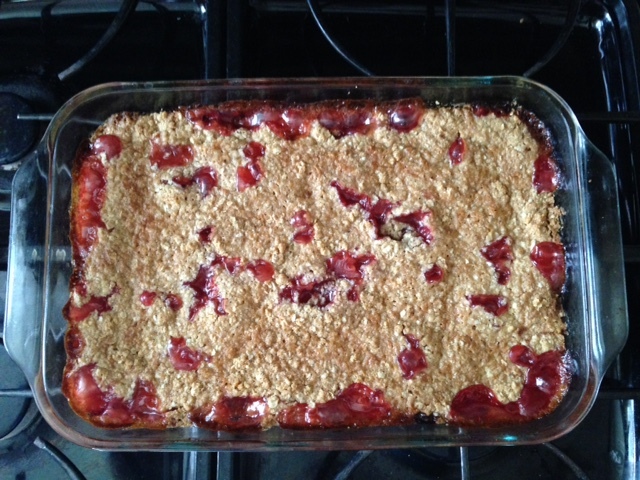 After careful review of each rhubarb recipe I looked up, I decided upon this one: Strawberry Rhubarb Crunch. Not only was it super easy, It turned out super delicious! First you sliced up the two main ingredients: Strawberries and Rhubarb. You mixed them with sugar and flower and laid them in a dish. The next step was to make the crumble topping! I was sure to make a lot of the topping because that is always my favorite part of a dessert! 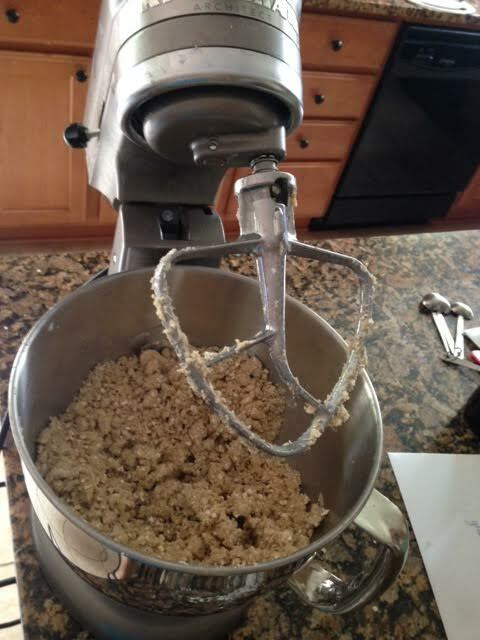 I used my mixer to really get things crumbled up good! 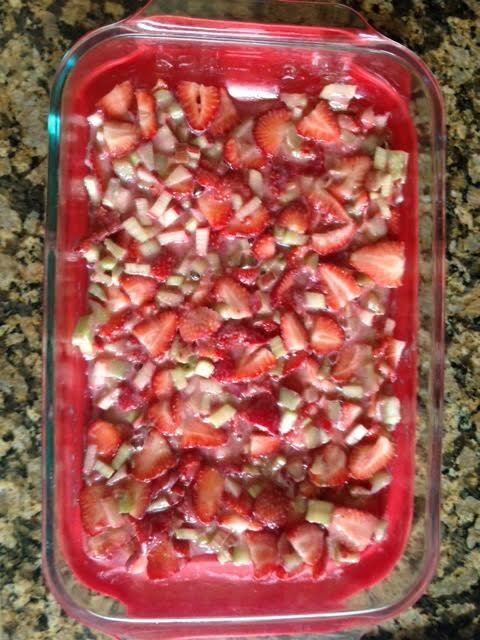 Once you made that you simply pour it on top, pop it in the oven and viola- beautiful and delicious Strawberry Rhubarb Crumble! I served this with some lactose free vanilla ice cream and it got the stamp of approval from everyone at the BBQ! Again- the Internet is my best friend. In this case I took to Pinterest. I saw quite a few different recipes using leeks but I knew I wanted something that was again easy. 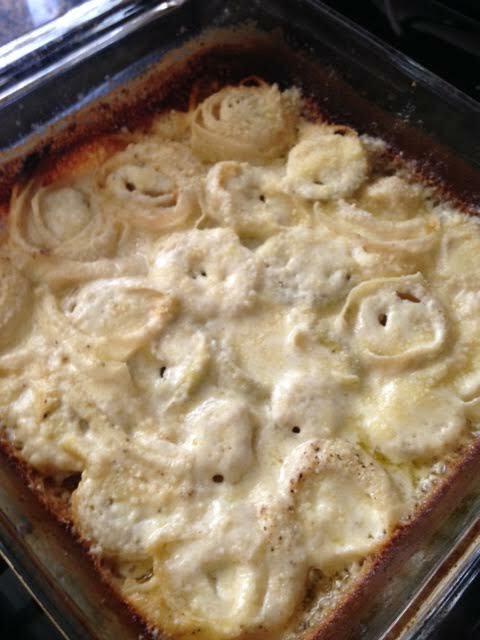 I decided on Leeks Baked in Cream. This really turned out amazing and I even got my kinda picky husband to try them and boom- he even liked them!!! After cleaning and cutting off the white part of the leek I sliced them into small circles. I was shocked that as large as a leek is, you really do not get much off of them! 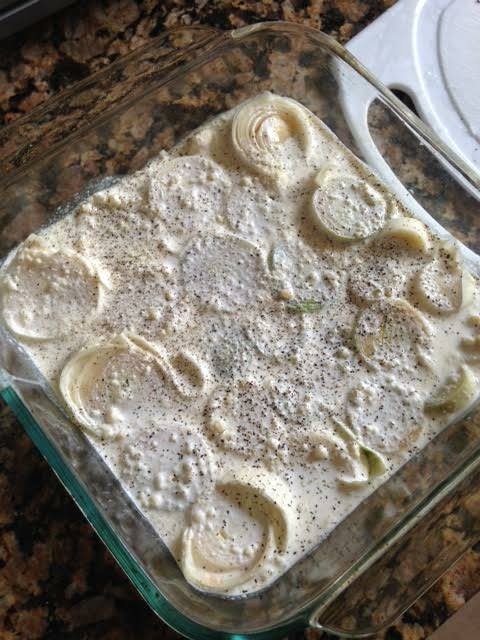 I placed the sliced leeks very close together in a 9×9 and then topped with the heavy cream, Parmesan cheese, and pepper mixture. 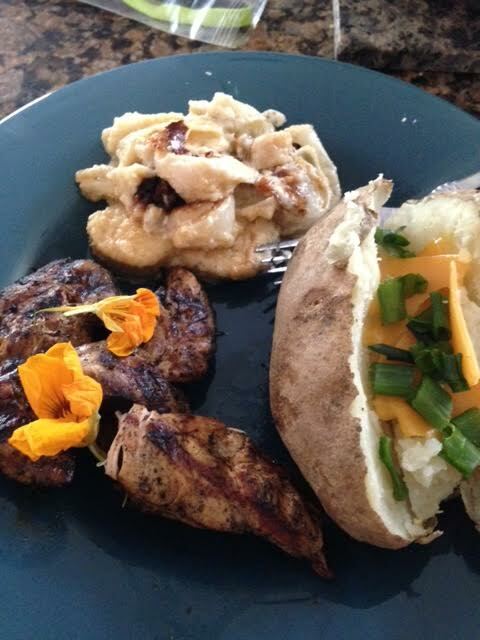 This easy mixture really gave the leeks a delicious creamy and cheesy flavor that was the perfect accent for our grilled jerk chicken! I baked the dish covered for an hour, took it out and took the foil off and baked for another 25 minutes. PERFECTION! The cheese and the cream seeped into every little part of the leek and it was really good! and did I mention super easy?! Along side our farm raised beef (Delmonico steak) we had an asparagus and radish saute. Very simple, on the stove stop butter and vegetable saute. Perfect little compliment and takes hardly anytime. I have really come to like radishes and may put them in the regular rotation of items I buy at the grocery store! Confession- I do not really like Kale at all. I tried really hard to like it because I know it is a super food, blah blah but it is not my thing. I do plan on trying to make some Kale chips! Courtney gave me some pointers and spice ideas so if these work out I will come back and provide an update! 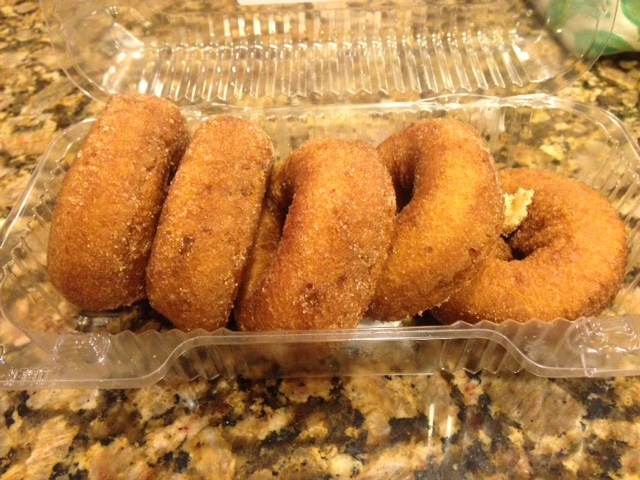 I also did a special addition this week: Apple Cider Donuts. These are the real deal. So good and light! While I do not plan to add them on each week, it is a nice treat and easy dessert after a long day! Kale. I found this delicious recipe last year and I am still I love with it! 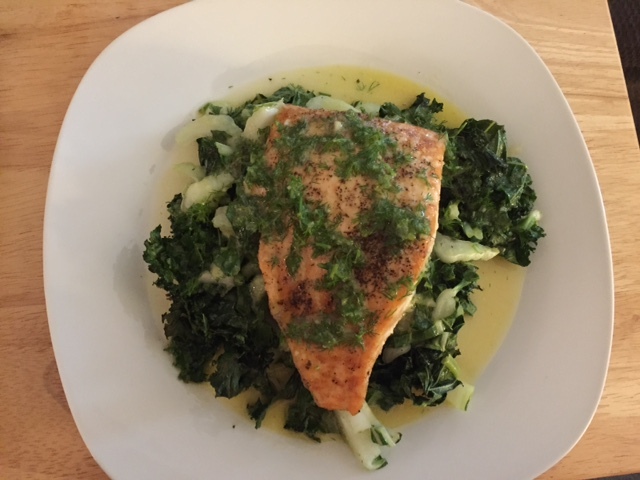 Martha Stewart’s Roasted Salmon, Cabbage, & Kale is the perfect early summer or early fall meal – especially when the kale and cabbage is fresh! You can use any type of cabbage. I prefer napa cabbage, but bok choy or savoy cabbage will work just as well. I did have an EPIC FAIL this week with my leeks. My Leek Vinaigerette did not turn out – AT ALL. They were rather horrible actually. Jimmy managed to eat some…but I truly think that was only because he felt bad because I was so upset about my kitchen fail. The leeks were so bad that I could not even sit next to him as he ate them – the smell turned my stomach. A good chef can always admit their bad recipes, right?! I used up my remaining spinach in an onion spinach quiche. I do not have a recipe for this one – as I simply combined a few recipes into one based on what I had available at my house at the time. Needless to say, the quiche was delicious! 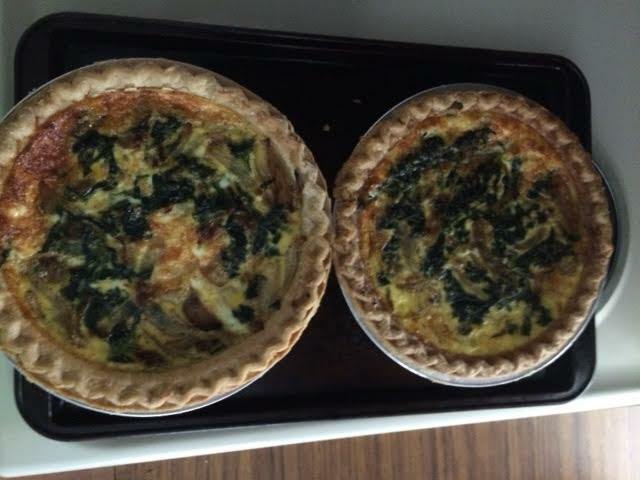 Maybe I will make another quiche this week since we are getting more spinach and this time I will write down what I add so I can share with you! Have you ever tried Rhubarb? Do you have a favorite leek recipe? How many of you are BBQing for MDW?